danger garden: April 2013, Bloomday! And here’s another, this E. characias wulfenii is in the back garden. I used to have so many E. characias wulfenii, now I’m down to just 2 plants…one of them slated to go when I find something else for its spot. Euphorbia rigida on the other hand is a plant I want a couple more of. I’m going to try and be patient and let this one get some seedlings going. Euphorbia amygdaloides var. robbiae scares some people, it can be rather invasive. I’ve never had a problem but wonder if the hydrangea helped to keep it in check. We shall see. Here’s a volunteer Grape Hyacinth growing dangerously close to a Dasylirion. In the great wasteland to the north of the patio I still haven’t bothered to eradicate the Vinca. And another…the color got a little whacky on this one but I decided I liked it. This concludes the Bloomday fun in my garden. Visit our hostess Carol at May Dreams Gardens for links to all the other blogs participating this month. Those Clianthus flowers are fascinating, they remind me of vampires, like bloody dripping fingernails, or fangs. Pulsatilla flowers are so wonderful, I just love how furry they look. I just bought a Euphorbia 'Fire Charm' this past weekend, which is similar to 'Fire Glow,' but shorter. Hmm...I guess I'll see if it tries to take over my garden. Theoretically they should get even better as they still aren't quite open (the Clianthus flowers). I almost bought a 'Fire Charm' at Joy Creek last week. It's a good one! Just when it seems foliage is the focus of your garden you post all these stunning blooms. More than one photo is required here, especially the euphorbias which are striking in their style and abundance of bloom. Borrowing from the neighbors is fun. I'm kind of lamenting the fact my Euphorbia wulfenii blloms aren't as full as others around town. Maybe they haven't finished expanding yet. Unfortunately the E. Blackbird is particularly short-lived, I think...I had a similar issue. E. amygdaloides doesn't seem to troublesome (the creepers are large enough to snuff out if desired, but I recommend against E. cyparissus 'Fen's Ruby'. That bugger is very finely rooted and sneaky. Albeit quite attractive. I'm glad you hear you say that about 'Blackbird' as that has certainly been my experience. My mom (of all people!) gave me a bit of E. cyparissus 'Fen's Ruby' before I knew...luckily I find it pretty easy to pull out although I agree it is sneaky! Oh Ms. Bohl, your bloomers are flawless! Posting pictures of them on the interweb could get a girl a reputation! (For being a great gardener, what were you thinking?) Your great results with Clianthus make me want to plant it again. Happy GBBD! I was going to ask my friend JJ to pick up another Clianthus for me at Annie's but they were all out. Do you have a local source? I used to get mine at DIG on Vashon Island. I don't think that she always carries them but did for a couple of years and could probably special order them. DIG is an adorable place. Short ferry ride from Tacoma or Seattle. Also near Colvos Creek nursery, which carries a wide variety of inexpensive and rare plants, in small and cheap sizes. Worth a stopover. I know huh? Imagine a whole massive bunch of them! All this from one who claims not to care much for flowers! Or is that another turnaround in the name of "flexibility"? Whatever...your garden is putting on a splendid show. 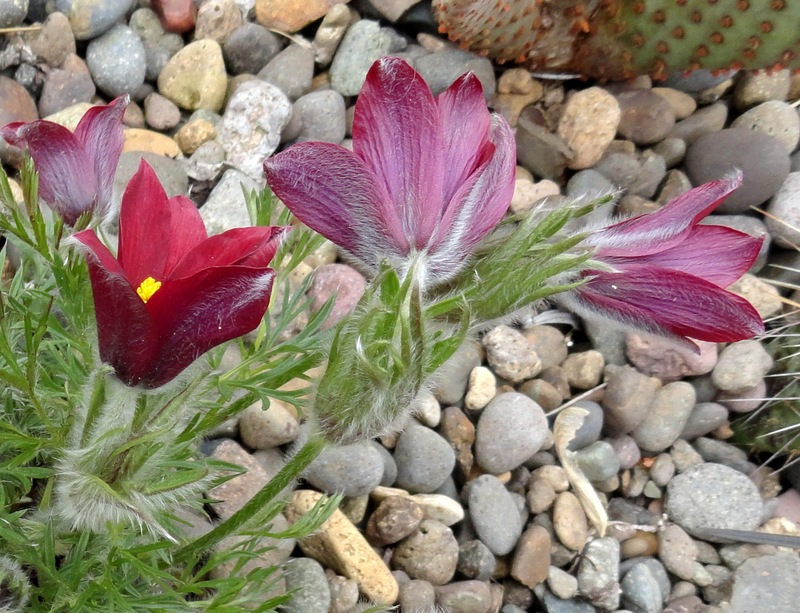 It's the foliage that I buy for (well except for the Pulsatilla, that I bought for the seed heads)...how can I help that they also come with flowers? FYI, I purchased an acacia Pravissima at the Hortlandia sale. My friend and I walked around and noted the plants that had that "Danger Garden-y" vibe. I'm afraid I almost failed completely at purchasing "Danger Garden-y" plants at the sale...this kind of makes me sad. Did you get a big Acacia or one of those super good deal little ones? (like $6ish) Those were so cheap I almost bought another just because. Dang, how did I miss those acacias? The acacia I bought was a pretty good size and I think it was $18? When I saw the little display with a twig of acacia with the little yellow pom-poms, I was sold! I bought a couple of beautiful, bright yellow grasses from cistus called something like Libertia Ixiodes "goldfinger". (I might have totally butchered that name). Excited about those too. MulchMaid, maybe they were all scooped up by Sunday? Wow...beautiful blooms! Glad you included the photos of E. characias wulfenii. They are amazing! I wish you could see some of the other E. characias wulfenii around town, they are so much better than mine! I think mine are getting past their prime and need to be replaced. Wow! That is quite a bloom day. Such a selection of euphorbias. I always see so many in the England but other than the E. rigida they don't do well here. I love everything you have flowering there. Thanks LR, I added to the Euphorbia collection a little bit last week. They are just so varied! Ahhh, Spring is definitely here. So many beautiful things. Isn't it wonderful? Today here is the first day in the mid-teens C (60F) for FIVE MONTHS! I feel your pain...hopefully you're on the road to weather happiness now! Oh indeed, luckily looking at my plant list helps (http://dangergarden.blogspot.com/p/my-plants-list.html) or going back and looking at last years Bloomday posts does too. Glad you highlighted Euphorbias and their pretty and unique looking blooms. And I didn't realise how colourful Euphorbia rigida blooms can be until now (somehow I never paid close attention to them before). Loving your euphorbias and grevilleas, neither of which I have enough of. Nor are mine in bloom. Why didn't I buy any yesterday?? Why didn't you indeed? You should track down 'Orange Zest' (Grevillea) from Xera (perhaps Garden Fever will bring it in)...it's amazing! Pictures to come later this week. Wow, lots of stuff in bloom! Great to see an Acacia pravissima since I just bought one at the Ruth Bancroft Garden spring sale! I'm surprised you didn't already have one, I bet it will love your climate! Amazing! I especially love the coloring on the Euphorbia characias wulfenii. I can see why you have a hard time deciding which images to post! I need to get those new 'bonfire' in the ground before the stop blooming! Beautiful pictures as always! I've been trying various forms of Euphorbia for a while, only to watch them all die. Sigh. There is one more new one (Bonfire) trying to make it in the front garden now. And Ceanothus is always pretty! I am lucky to live somewhere that these euphorbia are happy! Thank you for proving the point I've made to my husband. I really, really haven't bought every flowering plant):- I must shop for MORE! Oh plant shopping is a point I love to help prove! Do you need a signed letter? Where did you get your Anigozanthos? I was out there looking at mine today and it looks like it may actually have a little life in it. And do you have Euphorbia 'Fen's Ruby'. Loving the bloom on that this year. Great mix of natives and exotics! So many unusual flowers. Your wulfeni blooms are different, I don't think mine have the dark pointy parts in the center. Great photos. I like the dark burgundy Euphorbs in my garden, they seed around a lot. The Clianthus buds make me think of tropical bird heads. This is the first time I've noticed the dark centers to those blooms. That plant is actually a grown up seedling of one of my old wulfenis maybe it's a strange hybrid? Wow, euphorbias! The first few shots remind me of the eyes on peacock feathers: very striking en masse. And I really love the deep purple/burgundy and chartreuse color combo that runs throughout. Clianthus puniceus...dramatic now, but must be amazing in full bloom. I do have a love of that deep purple/burgundy and chartreuse color combo! So many fascinating blooms. I had to keep scrolling up and down to take it all in.